Content creation for digital marketing can be a fun yet challenging exercise. 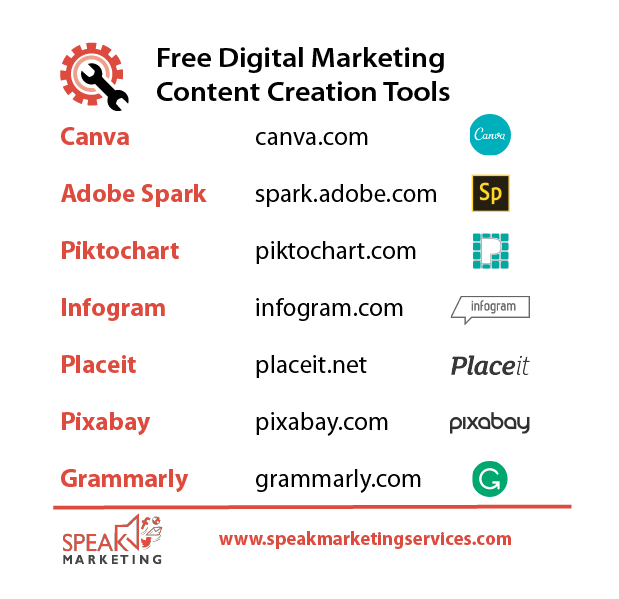 The tools listed below all make the process of creating content easier – and best of all, they’re free. Canva – Create graphics for your digital marketing using Canva’s easy drag and drop program. You can choose from a wide variety of templates, upload your own photos, and overlay text all in under ten minutes. Adobe Spark – Similar to Canva, Adobe Spark allows you to create your own media using images and text. Spark, however, spans across many different types of media including social media, web pages, and even video. Piktochart – This tool allows you to make professional looking infographics with ease. Piktochart offers many templates to choose from and files can be exported to use in social media, on websites, and in presentations. Infogram – If your content tends to be a little heavier on the data side, Infogram may be perfect for you. The program allows you to create infographics, charts, maps, and more with 37 free templates to choose from. Placeit – Looking for an easy tool to create mockups on digital screens including mobile phones, desktop computers, and laptops? Placeit is a free mockup generator that enables you to create a screen representation of your app, website, and more. Pixabay – Finding royalty-free imagery can be difficult at times. Pixabay offers a comprehensive library of free photos and includes several resolution download options. Grammarly – While not quite as exciting as some of the more visual tools, Grammarly is a must-have for any content creator. Use their website to copy and paste text and search for spelling and grammar errors or download their plugins which are available for several different browsers as well as Microsoft Office. Digital marketing content creation doesn’t have to be a chore. With the tools listed above, you will find yourself discovering new possibilities and finding new inspiration. Let us know how they work for you! Caitlyn Braegelmann, Owner of Speak Marketing, is a marketing expert who helps her clients grow their businesses by utilizing strategic marketing promotions and communications. With an MBA in Marketing from Loyola Marymount University, web design certification from the University of California, San Diego, Certification in SEO from Google Analytics Academy and an Accreditation in Public Relations from the Public Relations Society of America, Caitlyn is well versed in many areas of marketing. Her professional experience includes marketing strategy, product promotions, social media, public relations, email marketing, direct marketing and much more. With a true passion for marketing and helping her clients succeed, Caitlyn has the drive and know-how to set your company apart. To view Caitlyn’s LinkedIn profile, click here. Need assistance with your marketing efforts? At Speak Marketing, we specialize in marketing strategy, social media marketing, market research, website design, public relations, email marketing and more. Whether you need some help to jump start a project or would like ongoing management and support, Speak Marketing will tailor a solution to best fit your needs. To learn more about what Speak Marketing can do for your business, click here.